Spanish champions Atletico Madrid are now seven points behind city rivals Real after losing to Villarreal - their only home league defeat of 2014. 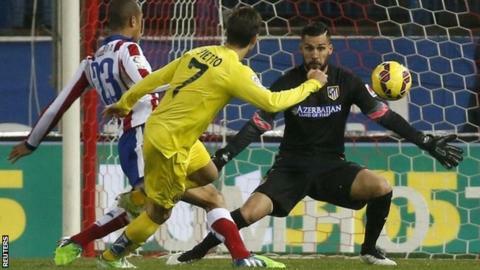 Mario Mandzukic had Atletico's best chance but his close-range shot was saved by Sergio Asenjo. Villarreal's Luciano Vietto scored the only goal with six minutes left after beating Diego Godin on the edge of the box to fire home. Atletico are third, three points adrift of second-placed Barcelona. Vietto, 21, was thankful to Atletico coach Diego Simeone - who handed him his professional debut at Racing Club three years ago. "He's the coach of Atletico Madrid now and I am a Villarreal player," Vietto said as his side rose to sixth in the league. "I will always be grateful to him for believing in me and giving me my debut." Match ends, Atlético de Madrid 0, Villarreal 1. Second Half ends, Atlético de Madrid 0, Villarreal 1. Corner, Atlético de Madrid. Conceded by Jaume Costa. Foul by Diego Godín (Atlético de Madrid). Sergio Asenjo (Villarreal) wins a free kick in the defensive half. Diego Godín (Atlético de Madrid) wins a free kick in the attacking half. Jonathan dos Santos (Villarreal) wins a free kick on the right wing. Attempt missed. Diego Godín (Atlético de Madrid) header from the centre of the box is close, but misses to the left. Assisted by Juanfran with a cross. Substitution, Villarreal. Antonio Rukavina replaces Luciano Vietto. Alessio Cerci (Atlético de Madrid) wins a free kick in the defensive half. Foul by Moi Gómez (Villarreal). Koke (Atlético de Madrid) is shown the yellow card for a bad foul. Foul by Koke (Atlético de Madrid). Mario Suárez (Atlético de Madrid). Bruno (Villarreal) wins a free kick in the defensive half. Goal! Atlético de Madrid 0, Villarreal 1. Luciano Vietto (Villarreal) right footed shot from the centre of the box to the centre of the goal. Assisted by Moi Gómez. Diego Godín (Atlético de Madrid) wins a free kick in the defensive half. Corner, Villarreal. Conceded by Moyá. Attempt saved. Denis Cheryshev (Villarreal) left footed shot from the left side of the box is saved in the bottom left corner. Assisted by Moi Gómez with a through ball. Attempt missed. Tiago (Atlético de Madrid) right footed shot from outside the box is high and wide to the right. Assisted by Mario Mandzukic. Attempt missed. Diego Godín (Atlético de Madrid) header from very close range is high and wide to the left. Assisted by Koke with a cross. Corner, Atlético de Madrid. Conceded by Víctor Ruiz. Attempt blocked. Moi Gómez (Villarreal) left footed shot from outside the box is blocked. Assisted by Tomás Pina. Substitution, Atlético de Madrid. Mario Suárez replaces Arda Turan. Offside, Atlético de Madrid. Koke tries a through ball, but Alessio Cerci is caught offside. Mario Mandzukic (Atlético de Madrid) wins a free kick on the left wing. Foul by Tomás Pina (Villarreal). Substitution, Atlético de Madrid. Alessio Cerci replaces Gabi. Luciano Vietto (Villarreal) wins a free kick in the defensive half. Hand ball by Moi Gómez (Villarreal). Substitution, Villarreal. Moi Gómez replaces Ikechukwu Uche. Attempt missed. Koke (Atlético de Madrid) header from the centre of the box misses to the left. Assisted by Gabi with a cross. Substitution, Atlético de Madrid. Antoine Griezmann replaces Raúl García. Substitution, Villarreal. Tomás Pina replaces Manu Trigueros. Koke (Atlético de Madrid) wins a free kick on the right wing.